See ticket pricing for purchase at the gate and pre-sale below. *Fourth of July event pricing is $25/adults and $15/children 7-15. Other information can be found at the link below. While the roots of rodeo in this modest little Northwest Colorado ranch town and world class ski resort trace back over 100 years, the humble beginnings of the Steamboat Springs Pro Rodeo are known to go back more than a century. No one knows for sure when Steamboat Springs hosted its first organized rodeo competition, but mentions of competitive rodeo events in the Steamboat Pilot, date back to at least 1898. Looking through historical files, it seems that no local event was complete without some type of rodeo competition. Steamboat was full of skilled cowboys and cowgirls, and horses that were bred for work, not temperament, and tended to be large and a bit ornery. The local cowboys thought nothing of riding these hard-to-handle animals, and casual bets often resulted in impromptu rodeo-type competitions in fields or right on Lincoln Avenue. Back at the turn of the 20th century there was no rodeo arena in Steamboat, but the area where the current rodeo arena stands near the Yampa River was the location for many rodeo events. During the summer of 1907 for Game & Fish Day, spectators formed a rodeo ring by positioning their horses in a circle, heads turned inward. In later days, cars were used to form the circle. In the mid-1970s, the weekly organized event was known as the “Friday Night Jackpot. By 1982, the Jackpot Rodeo was in danger of disappearing due to funding. Local property manager Steve Dawes felt like the rodeo was too important to lose, so he stepped forward with his checkbook and his staff to add a little business expertise to the operation. Within a few years, the Jackpot Rodeo grew to include Saturday night, and the Steamboat Springs Rodeo Series name was coined. In 1988, the first and last weekends of the 10-week series were sanctioned by the Professional Rodeo Cowboys Association (PRCA) and were known as Ski Town Stampede I & II. With the success of its first two forays into pro rodeo, the committee decided it was time to go "all pro." The rodeo has been fully sanctioned by the PRCA since 1989. Years and years of effort were recognized by the rodeo industry in 2002. 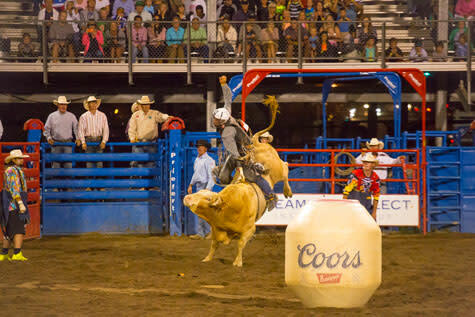 By a vote of contestants, stock contractors, contract personnel and other rodeo committees, the Steamboat Springs Pro Rodeo Series was selected from approximately 500 PRCA rodeos as 2002 Small Outdoor Rodeo of the Year. Today, the series lights up Friday and Saturday nights throughout the summer, keeping alive the true Western tradition of Steamboat Springs. See descriptions of the most popular rodeo events below and check out the frequently asked rodeo questions to make the most of your rodeo experience. A: The gates open at 5:30 p.m. If you want to enjoy the delicious barbeque, you should plan on allowing yourself enough time to eat before you sit down for the rodeo, which starts at 7:30 p.m.
Q: Where is the best seat? A: All seats offer an excellent view of the arena. However, since all seats are general admission, if you want to sit in a particular area, like the grandstands, try to be there by 6:30 p.m.
Q: Where are the rodeo grounds located? A: The Brent Romick Rodeo Arena is located just a couple of blocks from downtown at Fifth Street and Howelsen Parkway in the Howelsen Hill sports complex. A: There is parking on the rodeo grounds and nearby. If you want to avoid the crowd after the rodeo ends, you can park downtown and walk to the rodeo arena. Q: What concessions are available? A: An on-site barbecue with beef, chicken, ribs and sides heats up at 6:00 p.m. complete with thirst-quenching beverages for the entire family. Bars serve beer for those 21 and over. Q: Should I bring a jacket? A: The temperature cools down after the sun goes down, especially during the early part of the summer season. We recommend that you bring a jacket or a blanket to keep warm. A: The rodeo goes on even if it rains. As the arena gets muddier, the action can become even more entertaining to watch. The arena’s grandstand seating area is covered in case of inclement weather. Q: How long does the rodeo last? A: Approximately two hours. Occasionally it may go a little longer. A: No, dogs are not allowed at the rodeo. It is dangerous for your pet, as well as the rodeo animals. Q: Can I pet the animals? A: Please do not go near the rodeo animals, especially the bulls. These animals are not pets and can be temperamental. Q: What is there for children to enjoy? A: From rodeo clowns to roping games, there’s plenty to keep the kids occupied while anticipation builds for the show to start. There’s even a chance to get in on the action in the arena with the Calf and Ram Scramble events, where children chase around a calf or a sheep to earn the ribbon on its tail as well as fun prizes.